White House Correspondent in Washington, D.C.
"I was impressed with Kimberly's previous journalism experience and her ability to multitask and work under pressure. Her willingness to step out of her comfort zone, learn something new and work as part of the news team was a plus! She has successfully completed a myriad of stories and long-form projects pertaining to U.S. foreign policy, national politics and news feature stories. Kimberly has demonstrated that she has what it takes to succeed in this ever-changing and demanding field." "Point Park University has provided me with the education to succeed. As a student, you get hands-on experience from day one. One of the greatest aspects of the school is being able to surround yourself with people who are as dedicated as you. The small class sizes allow my professors to know my career goals and help maximize projects to help me grow professionally." 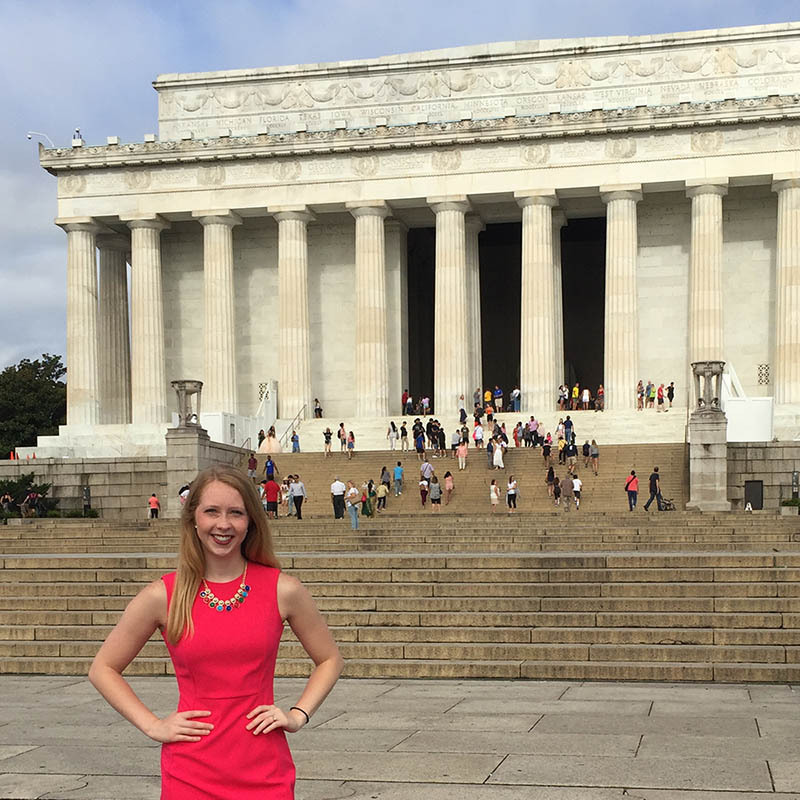 How did you land an internship in Washington, D.C., and the opportunity to study at the Institute of Political Journalism? I landed my internship and the opportunity to study at the Institute of Political Journalism by applying to The Fund for American Studies (TFAS). I was accepted into their program in December and was matched with Al-Arabiya News Channel. TFAS offers students the opportunity to attend events at the National Press Club, and regular briefings at principal news sites such as the U.S. Department of State, Capitol Hill and embassies. I have worked on all different kinds of projects during my internship. I usually produce at least one package related to the news of the day, logging interviews and conducting in-depth research for future packages. I worked on two 22-minute documentaries about the high cost of prescription drugs in the U.S. and about the increased number of Arab-American women running in the 2018 election. My favorite project was covering the Supreme Court ruling of President Donald J. Trump’s travel ban in June. I assisted and produced a field liveshot, package, and wrote a story for Al-Arabiya’s website. How will you apply what you learned this summer to your remaining experience at Point Park? The skills I learned this summer will be applied when I work on packages and shows for U-View. The experience I gained in editing and writing scripts has provided me with better news judgement for future stories. Why did you choose Point Park to pursue a degree in broadcast reporting? I chose Point Park because of the opportunity to get hands-on experience. The wide variety of shows U-View offers allows me to gain knowledge and the skill set I needed to succeed as a student journalist. The opportunity to learn from Emmy-award winning and accomplished professors also impacted my decision. Point Park University has provided me with the education to succeed. As a student, you get hands-on experience from day one. One of the greatest aspects of the school is being able to surround yourself with people who are as dedicated as you. The small class sizes allow my professors to know my career goals and help maximize projects to help me grow professionally. My advice to future interns is to make the most of your time during your internship(s). Reach out to people you admire and seek informational interviews. The tips I received from the people I networked with has been so helpful in deciding my future education and journalism career.